Allansford is a rural/residential town in western Victoria, on the Princes Highway where it crosses the Hopkins River, 8 km east of Warrnambool. In 1839 the brothers William and John Allan took up their ‘Allandale’ pastoral run adjoining the Hopkins River. There was a dry weather ford across the river, and the combination of that and the name of the property owners resulted in Allansford becoming the place name. A timber bridge was built beside the ford in 1851. In 1855 the third brother, John Allan, owner of an adjoining property ‘Tooram’, subdivided land from the property for the Allansford township. He included land for a school (1856) which is on the Victorian heritage register. Among the town’s early institutions were a hotel (1856), a post office (1860) and a Presbyterian church (1861). The present Junction Hotel’s origins were in 1878. During the 1870s and 1880s the owner of ‘Tooram’ ran a large dairy herd on the property. 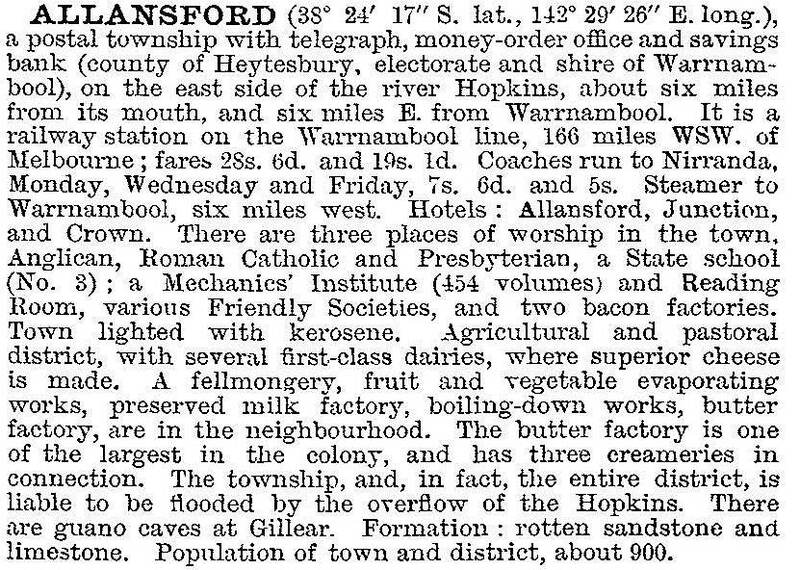 In 1889 the railway line from Terang via Allansford to Warrnambool, was opened, providing improved market access for dairy products. By then the Warrnambool Cheese and Butter Factory (1888) was opened at Allansford. The factory maintained a strong market position and in 1935 entered into an agreement for Kraft Walker to take over cheese production. Between 1901 and the 1920s Allansford’s population doubled to about 650 people. The butter factory (a farmers’ cooperative) opened the Acme General Trading store in 1934, the year before the Kraft venture. After World War II the population fell, but between 1966 and 1996 it grew again. A kindergarten was opened in 1972 and the school was enlarged for district attendance. It had 152 pupils in 1998. Allansford has the Acme rural supplies and general stores, several other shops and businesses, the hotel, the Warrnambool cheese and butter factory (and Allansford Cheese World opened in 1986 across the road from the factory), Jubilee Park with camping, boating and swimming facilities, a public hall (1911), Anglican (1881), Catholic (1890) and Uniting (1861) churches, a kindergarten and a school (163 pupils, 2014). The Premier Speedway (1970) is 1 km westwards. Dairy processing accounted for 14.6% of Allansford’s employment at the 2011 census.